In many organisations, data prep is reserved for people who have specialised skills: the data engineers and data scientists in your company. Only once the data is prepared can analysts and business users start performing their analysis. Tableau Prep changes this by empowering your entire organisation to prepare data faster and more intuitively than ever before. It gives your team the tools they need to confidently combine, shape and clean their data for faster time to insight and better business decisions. 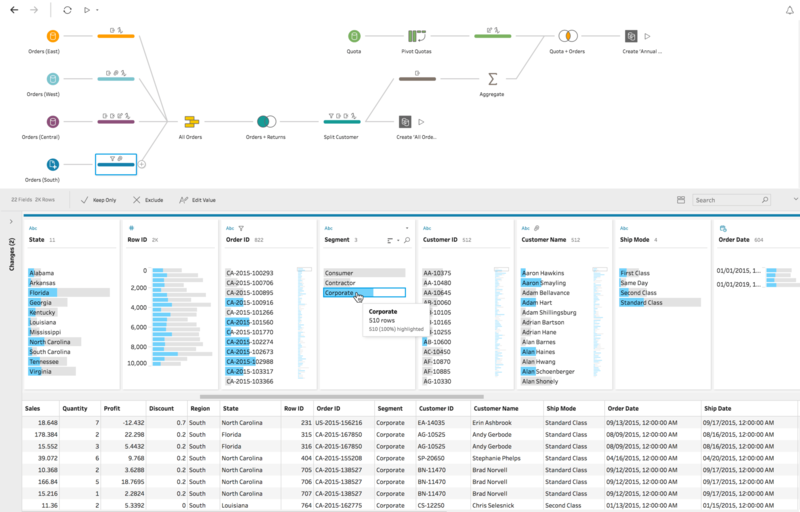 Tableau Prep is comprised of two products: Tableau Prep Builder for building your data flows, and Tableau Prep Conductor for sharing flows and managing them across the organisation. Three coordinated views let you see row-level data, profiles of each column and your entire data-preparation process. Pick which view to interact with based on the task at hand. Tableau Prep Builder is part of Tableau Creator. See offerings and pricing. If you want to edit a value, you select and directly edit it. Change your join type and see the result right away. With each action, you instantly see your data change, even on millions of rows of data. Tableau Prep Builder gives you the freedom to re-order steps and experiment without consequence. Use smart features to fix common data-prep challenges. Tableau Prep Builder employs fuzzy clustering to turn repetitive tasks, like grouping by pronunciation, into one-click operations. 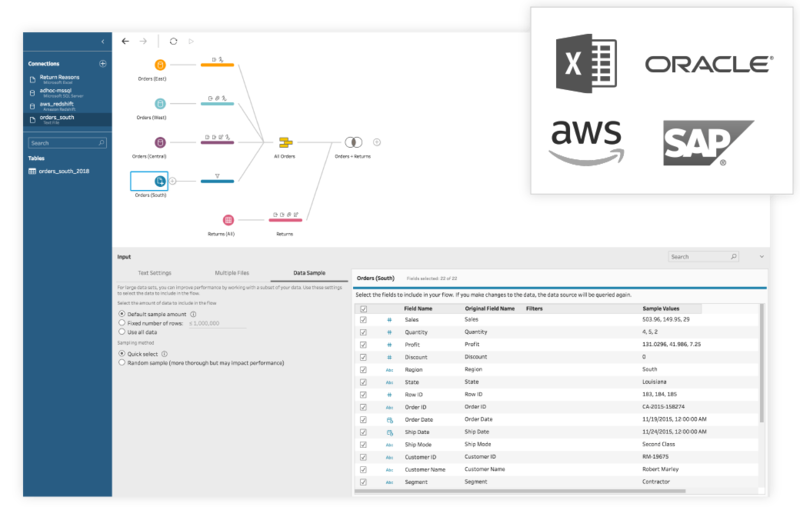 Connect to data on-premises or in the cloud, whether it’s a database or a spreadsheet. Access, combine and clean disparate data without writing code. 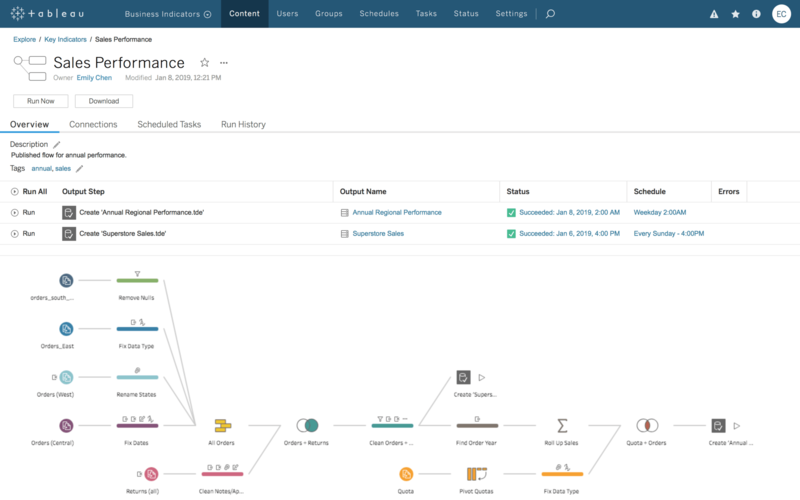 Tableau Prep Builder intelligently pushes operations down to the database when possible, letting you take advantage of existing database investments for fast flow execution performance. Connect to the data you care about. Stay in the flow of your analysis. It’s easy to open your output with Tableau Desktop or share it with others via Tableau Server or Tableau Online. Easy sharing reduces friction and helps you bridge the gap between data preparation and analytics for better business results. 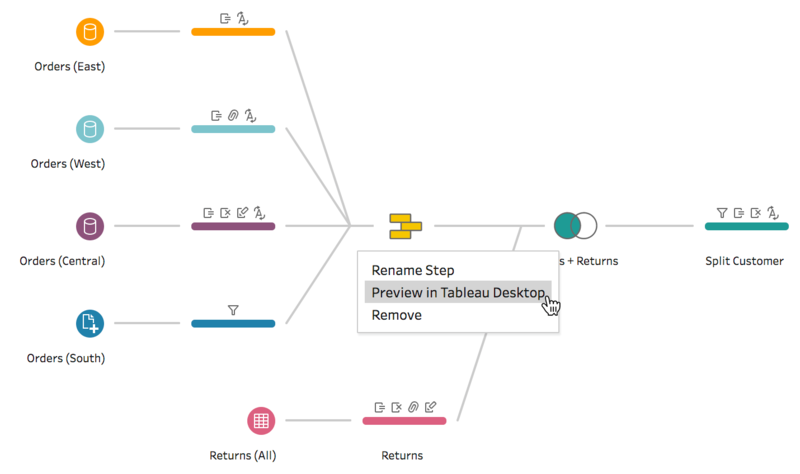 With Tableau Prep Conductor, you can easily publish and run flows in your server environment. Share your data sources securely using Tableau Server or Tableau Online. Create an environment where everyone in your organisation can work with prepped and up-to-date data. Tableau Prep Conductor is part of the Data Management add-on. Schedule your flows to run when you need them to – day or night. Automate your data prep processes so there's always fresh data that's prepped and ready for analysis. Monitor flows with the same tools available on Tableau Server today. Use the Status page, admin views and run histories to see the health of flows across the entire server so you can address any issues quickly. Always know if your flows are healthy with proactive alerts. Get even more from Tableau Prep. Already use Tableau? You'll feel right at home with Tableau Prep. Tableau Prep uses Tableau’s data connectors, calculation language, user permissions and administration views, so you can get going quickly. Enjoy fast interactions and flow execution with Hyper, our patent-pending data-engine technology. Hyper uses proprietary parallelism techniques to accelerate the data-prep process. Learn, connect and enjoy Tableau with more than 150,000 passionate users. Rely on forums, events and user groups to extend your Tableau Prep knowledge. Join the Tableau Community today. Tableau's software moves as fast as you do – and we are constantly releasing new features. We invest more in R&D than anyone else in the industry, so there's always a new release around the corner. Before Tableau Prep, our team would spend hours and hours making sure that our data sources were clean and organised, just to make sure that our analysis was accurate and effective. We’ve been able to save hours of work with Tableau Prep, completely reinventing the way we look at our data and dramatically shortening the time between data collection and actionable insights.